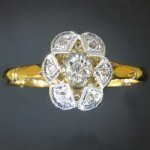 See our: diamonds rose cut. A small diamond chip with a flat base and cut in an irregular shape, usually somewhat in the form of a simplified circular rose cut diamond. Such chips were used in jewelry rather for their effect then for their intrensic value.